Last year we decided to celebrate our 45th wedding anniversary in Hawaii. After examining many different vacation options we concluded that the 7 day NCL Pride of America (POA) cruise along with 3 extra days in Honolulu offered the best opportunity to maximize our exposure to the islands. We&apos;ve cruised on 7 previous occasions but this was our first on NCL. For us, the key attraction of the POA cruise is that you are in port everyday and this allows the opportunity to arrange tours and/or activities. 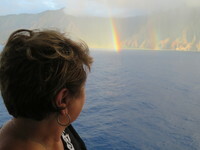 Other cruises to Hawaii originating from the west coast involve too many sea days for our liking. Overall, our experience on the POA was very positive. The ports that it sailed to gave us the opportunity to explore the islands with organized tour groups or on our own. We have nothing but pleasant memories of our first visit to paradise! We were particularly impressed with the ship&apos;s excursion services. Staff from the ship assisted each tour group off the ship and through the port terminals to meet tour guides and transport operators. We never were left standing around waiting for a bus or tour operator. Instructions on where and when to meet were clearly printed on the tour coupons delivered to our cabin at the start of our cruise. With regard to the deliverables there were no disappointments. There are many dining options on the POR and we selected a package of 3 specialty restaurants; Cagney&apos;s, LaCucina and Jefferson&apos;s Bistro. We were very pleased with our meals and service at Cagney&apos;s and the Bistro. The portion size and flavour of our entrees were a disappointment when we dined at LaCucina. When we returned to the ship each afternoon we went to the 11th or 12th decks for pool and lounge time. We always found plenty of space to relax and service from the bar was always nearby. There were a couple of times we sought assistance from Guest Services (lost key card, logging into the internet) and in each instance we received prompt and helpful service. No long waits at the counter!! In best indication of our overall level of satisfaction with our POA cruise is that before we disembarked we placed a deposit on a future NCL cruise. Rainbow viewed from our balcony. 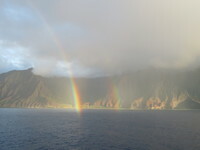 End of a rainbow while sailing along the Na Pali coast. Last year we decided to celebrate our 45th wedding anniversary in Hawaii. After examining many different vacation options we concluded that the 7 day NCL Pride of America (POA) cruise along with 3 extra days in Honolulu offered the best opportunity to maximize our exposure to the islands. We&apos;ve cruised on 7 previous occasions but this was our first on NCL. For us, the key attraction of the POA cruise is that you are in port everyday and this allows the opportunity to arrange tours and/or activities. Other cruises to Hawaii originating from the west coast involve too many sea days for our liking. Overall, our experience on the POA was very positive. The ports that it sailed to gave us the opportunity to explore the islands with organized tour groups or on our own. We have nothing but pleasant memories of our first visit to paradise! We were particularly impressed with the ship&apos;s excursion services. Staff from the ship assisted each tour group off the ship and through the port terminals to meet tour guides and transport operators. We never were left standing around waiting for a bus or tour operator. Instructions on where and when to meet were clearly printed on the tour coupons delivered to our cabin at the start of our cruise. With regard to the deliverables there were no disappointments. There are many dining options on the POR and we selected a package of 3 specialty restaurants; Cagney&apos;s, LaCucina and Jefferson&apos;s Bistro. We were very pleased with our meals and service at Cagney&apos;s and the Bistro. The portion size and flavour of our entrees were a disappointment when we dined at LaCucina. When we returned to the ship each afternoon we went to the 11th or 12th decks for pool and lounge time. We always found plenty of space to relax and service from the bar was always nearby. There were a couple of times we sought assistance from Guest Services (lost key card, logging into the internet) and in each instance we received prompt and helpful service. No long waits at the counter!! In best indication of our overall level of satisfaction with our POA cruise is that before we disembarked we placed a deposit on a future NCL cruise. Adequate size for 2 adults. Bed was comfortable. Plenty of room to store our luggage, clothes and travel items. Bathroom was tight but aren&apos;t they all on cruise ships! Magnificent national park! Walking through a lava tube was an incredible experience. If you are visiting Hawaii for the first time and want to learn about Hawaiian royalty and the culture of the islanders this would be a very worthwhile and rewarding visit. Exhibits and artifacts are outstanding. A true bonus is seeing the original cape given to James Cook when he came ashore. Give yourself about 3 hrs. Time we&apos;ll spent. P.S. Bring the kids. Plenty of exhibits for them plus a planetarium. Once you reach the Lookout, you have an impressive view of the valley below all the way out to the island&apos;s northeast shore. Beware it can get very windy. If driving on your own, be careful when leaving the lookout that you are on the roadway that leads to the right direction you are headed on the Pali Highway. Direction signs are not the best. Toured the Missouri and attended the USS Arizona memorial. Very impressive. Leave enough time to examine both the Road to War Museum and the Attach Museum before or after the Pearl Harbour Memorial Theatre. Very informative. The luau meal wasn&apos;t anything special. The other program activities made up for that, especially the music, costumes, choreography and the performers of the family story and their magical journey. Not much to view from the vessel. The fern grotto is the highlight of the tour and is an impressive sight to visit. Not hard to imagine why it was so popular for weddings. Breathtaking! Until you see it you can&apos;t believe a natural feature like could exist in Hawaii. Picture perfect morning. Excellent &apos;snorkelling 101course&apos; from crew for 1st timers like me made all of us feel safe. Awesome coral reef abundant with sea life. Tour bonus....dolphins followed our vessel. We are thankful we had a tour guide because he gave us a thorough description of the native plants of the valley, its distinct natural features and the historical events that occurred in this area. Time we&apos;ll spent! One of the best aquarium we have ever visited. Couldn&apos;t stop watching the sharks especially the hammerhead and tiger. Great exhibits for children. Wished I could have stayed to watch the scuba divers feed the sharks and tropical fish.